They exclusively use organic, outdoor-raised swine from Iowa (proving up their state motto: "We're more than just corn and Chris Kingsbury"), and cook it the same way they do in Central Italy: by stuffing it with garlic, rosemary, fennel, and fresh herbs, then sewing it all together before roasting for 3-4 hours to get their signature crispy skin. 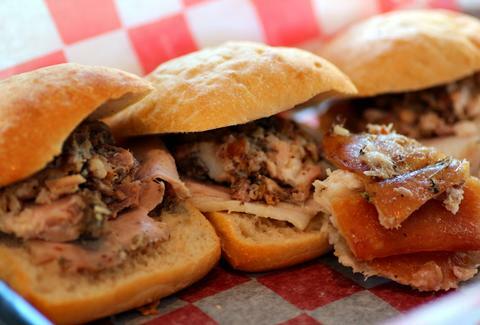 Because eating entire hog-logs is considered unseemly in most Western cultures, the porchetta's then sliced up and worked into the Bombardino sando w/ pickles, a giant swine platter w/ cannellini beans & a trio of sauces (including a sriracha-style job), and "Timmy, Jimmy, Tommy" -- three pork sliders with the delicious skin on the side, for you to either slap atop of the sandwich, or eat like the most delicious chips since sour cream & onion O'Boisies. They're keeping the booze appropriately Italian with glass and bottles of red, white & Prosecco, plus imported suds like Birra Moretti, enough of which will have you shouting in crowded rooms whether or not you get whatever the hell constitutes a Ruso-Canadian bingo.